My father-in-law and I had a very productive weekend. He’s leaving this Friday, so we’re trying to get as much as possible done before then so that I’ll be left with as many manageable rooms/areas as possible when he leaves. By “manageable” I mean that all of the two-person jobs will be completely finished, and I’ll be left with things that I can easily manage on my own. And it looks like by Friday, we’ll have the garage (already finished), dining room, entryway, and music room to that point for sure. And I’m hoping that we can also get the hallway to that point. Several of you asked about the insulation situation, and I explained that there’s no insulation in the walls. 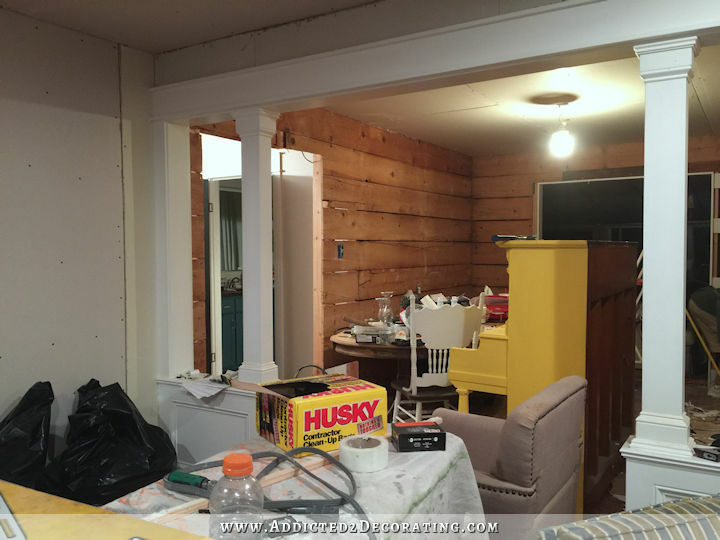 The only “insulation” is the two layers of shiplap (one on the inside and one on the outside), and then the foam insulation that backs the vinyl siding on the exterior of the house. 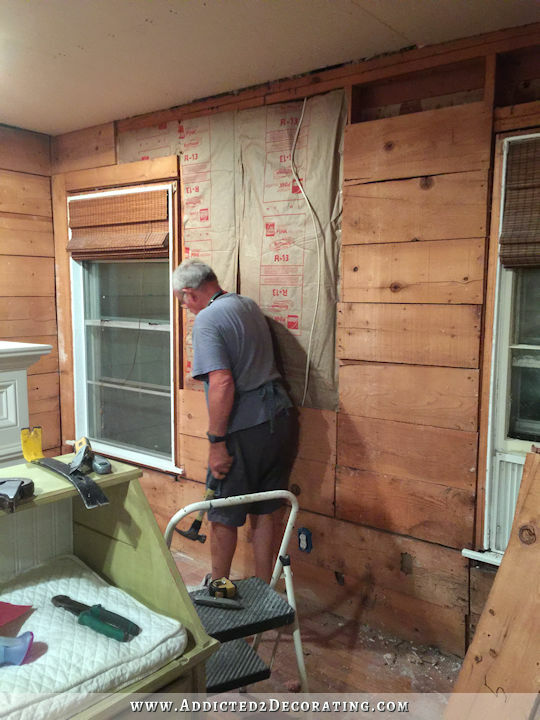 I had planned to just be content with that until we save up enough money to tackle the re-siding of the house in the future, and then at that time, I’d have the exterior walls insulated and wrapped with Tyvek. Well, I should have known that that wouldn’t be good enough for my father-in-law. 🙂 He’s not one to just settle for a “good enough” job when doing a thorough job is within reach. 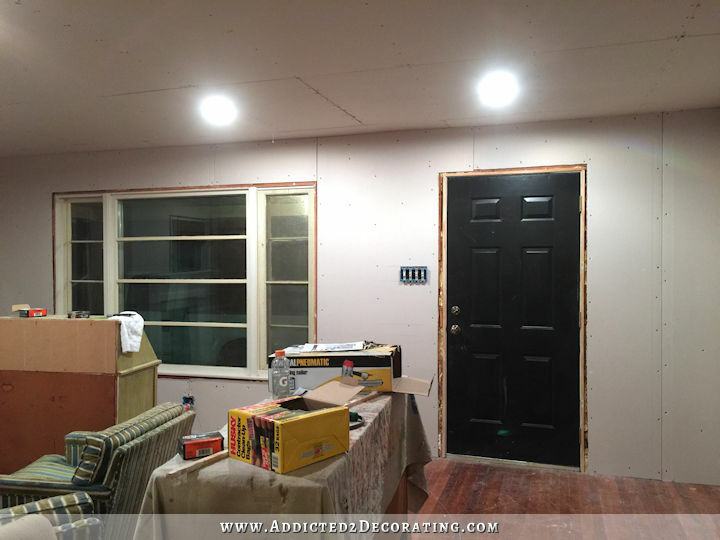 So he insisted that we remove all of the shiplap on the two exterior walls, add insulation in the walls, put the shiplap back up, and then drywall. It put us behind about a day, but I’m so glad we did it. I’m so glad he was here during this project, because I can assure you that had I been working alone, there’s no way I would have done all of that by myself. But I’m sure I’ll be so thankful that we did this come winter! 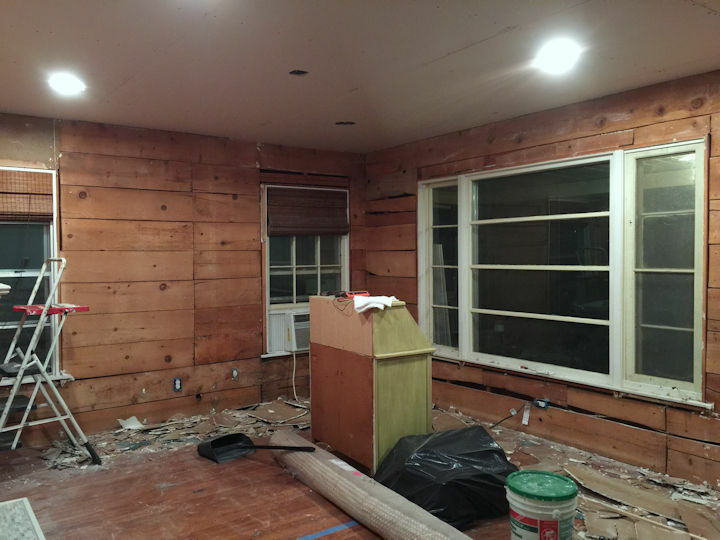 And then at some point, I also decided that now, with all of the old drywall down, would be the perfect time to go ahead and add the doorway from the dining room to the kitchen. So I got started on that. 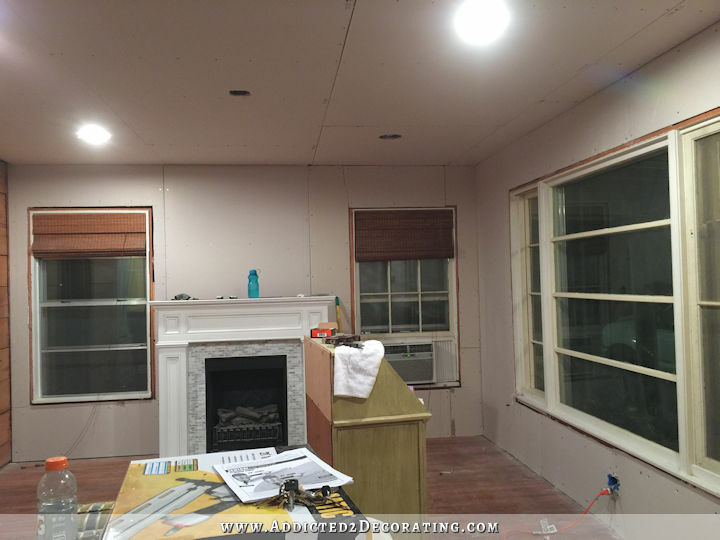 Anyway, after those detours, we were finally ready to start on the drywall, and we got all but the wall with the new opening drywalled. Hopefully we can get that wall finished today. And we didn’t stop there! We also began on the music room. I got started on tearing down the old drywall while he finished up the dryall in the entryway. And I also decided that now is the perfect time to widen the opening to the hallway before we put up new drywall. I widened it from its original 32 inches to about 46 inches! So I have about two more days of my father-in-law’s help (he plans to just relax and hang out with Matt on Thursday and Friday morning before he leaves), and I plan to squeeze every last drop of help out of him that I can. 🙂 Just joking. I’ve told him several times that he can stop whenever he wants, but he’s even more of a workaholic than I am, and loves this stuff at least as much as I do. Like me, he has a very hard time sitting still for long. Soooo….today’s another drywall day. Things should look vastly different by the end of the day. What Color Fireplace For My Black Breakfast Room? AWESOME! It looks so much brighter and lighter with the new drywall up. Great work. Wow! As nice as you’d made that front room before, this progress to a dining room is looking really great! I’m so happy for you that you have a wonderful father who is as manic about work as you are!! He’s going to need a vacation after his visit! Wow. This is wonderful. It gets a lot of the messy stuff over and done with (except for the taping and mudding) and gives you some breathing room, too. What a hardworking pair you are. No, the sunroom was an add-on much later, and they didn’t use shiplap in there. 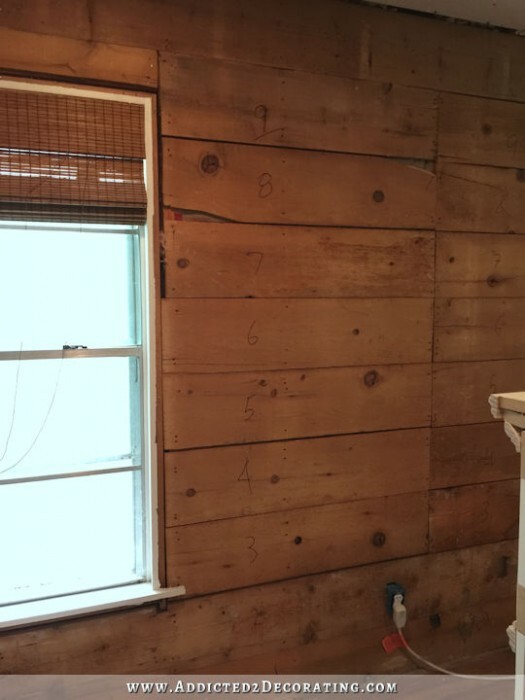 One wall does have the original shiplap siding that was originally on the whole exterior of the house, though. And it’s painted seafoam green. But they covered it up with something else. Hi Kristi. You and your dad in law were VERY productive this weekend. It looks like you had a whole construction crew in there. I think a door from the kitchen to the dining room is absolutely necessary. Did it mess up your cabinets or kitchen layout? . Nope, not at all! The opening is on the wall between the fridge and dishwasher, on the wall that was tiled from ceiling to floor (where my mom’s painting was hanging). It’s like a door was meant to be there all along. I’m so amazed by this renovation…I would never be able to do something like this. I’m learning so much from your posts. My compliments to you and your father in law. awesome job Kristi and FIL ….wow…what a difference. Blessings upon you and he as you work today. God bless you and your father-in-law! BEST FATHER IN LAW EVER! Wow, you guys are fast! Looks amazing! Your FIL is such a blessing. Could I borrow him for a few days? SuperKristi, and now SuperFIL! Soooo glad you got that insulation in, it is going to make a noticeable difference in your comfort and utility bill. And the door between the kitchen and dining room will be so much more efficient than having to traipse around through the music room. Woohoo! When you get to the sheetrock sanding, will you use the wet method to keep down the dust? Tell your FIL that he’s got a fan base here on your blog. Geaux, Dad! I’ll try it, but I’ve never had much success with the wet method of sanding in the past. It sure woudl be nice if I can get it to work to cut down on the dust! Please tell your father-in-law that I love him so much for knowing how very important that insulation is. It’ll not only lower your heating bill in winter, but also your cooling bill in summer. Love what you’re doing with that house. I’m so glad for you that you get so much of the no-fun-stuff done with that amazing help and can move onto the fun-stuff (for you 🙂 ) afterwards! 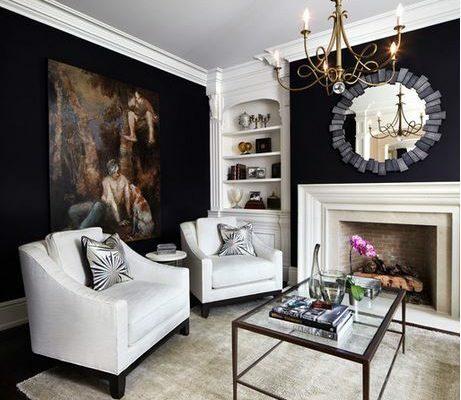 To me it was especially pleasing to see that you got rid of your stripe and nailhead trim experiment without having to pry out all the nails one by one (as I sincerely hope…) in the music room. The thought of you having to remove that gave me the creeps for a while now!!! OK, nothing you do will ever surprise me again! This is beyond productive! It is DESIGN in action! 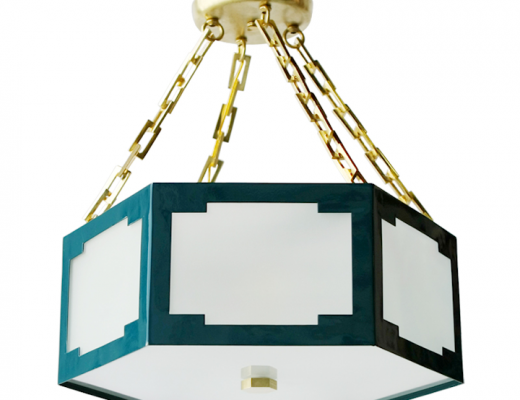 But….my Hubs and I have only ever hung our sheet rock horizontally on the walls and parallel to the ceiling rafters. 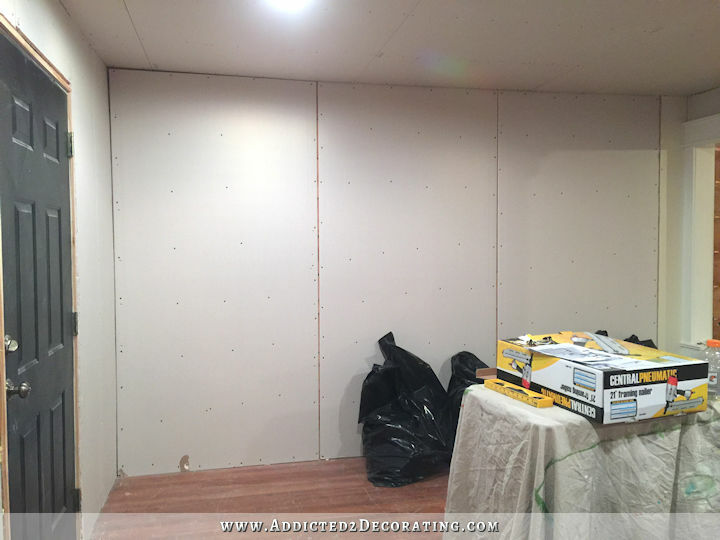 Does it matter if you hang sheet rock vertically on walls? Ithink you have hung yours that way because you go across studs. Kristi does not have that structural problem with ship lap. 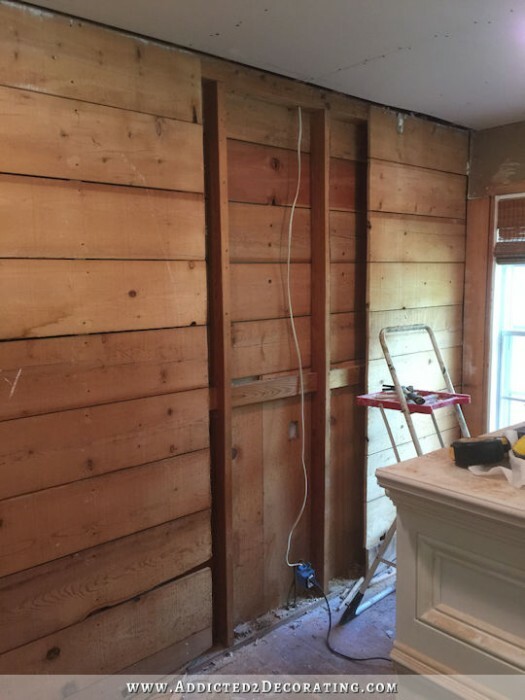 It seems that professionals hung the drywall sheets horizontally because it’s easier to mud and sand at the same level, as opposed to going up and down. I am also hanging drywall right now, and my knees agree with the horizontal seam. Kudos to you and your hardworking FIL, Kristi, for all the hard work AND the insulation part. Your FIL is such a blessing to you and Matt. I’m so glad he’s there helping you. You two make a great team together and I’m sure you both know what the other ones thinking most of the time. Everything is going to look so awesome with all that sunshine. I am thrilled that you father-in-law was able to change your “insulate later” plan. Not only will it help during the winters, but also help keep things cooler in the summers. The wider doorway for the hall makes a huge difference as does seeing the front door/yard from the kitchen! 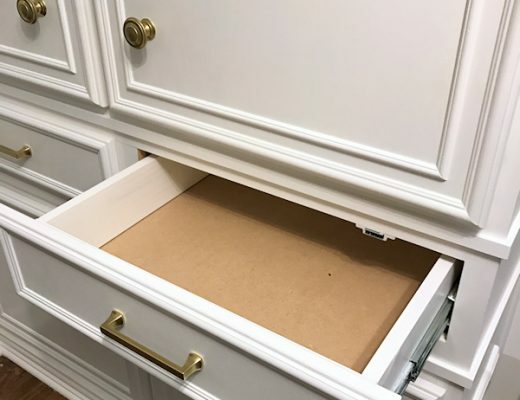 So much more open! Am hoping the change in air flow makes it easier and more efficient to heat and cool! So excited for you! The insulation is so important. And lower bills means more money for pretty stuff lol. I am so glad you are happy with the kitchen opening! And that Matt will have easier access through the hall. Give your FIL a be cyber hug! He is the BEST! Ooooh Kristi I’m sooo excited to see all the progress you’ve made!! This is looking amazing! Your FIL is one rad dad. Yay! Such great progress! I hesitate to even ask… windows??? I’m having someone come out next week to give me an estimate. 🙂 Hoping that we can fit it into our budget right now!! If not, I’ll just have to live with these a while longer and save up for new windows a bit later. Yea for the insulation & your FIL! Love the kitchen door. Did you make the hallway opening as wide as the hall or is there still room for a table or other pretty stuff ? Please get 3 window estimates. you may be surprised in price differences between contractors. Hopefully your HVAC system pricing will leave money for windows. Can’t wait to see the rest. Wow, wow and wow!!! What an amazing huge amount of work and progress you and your FIL have made. You must have been working around the clock. What a great team you both make doing all this work together. You are so very lucky to have your FIL there to help you with all of this work. He’s certainly a wonderful FIL and we love it that he’s been there helping you with these massive projects! This is all getting very exciting and we can’t wait to see more progress pictures with the new doorways etc. Well done!! So… why did you paint the piano before you did the dry wall? Because I wanted to. 🙂 I don’t understand how one is related to the other. 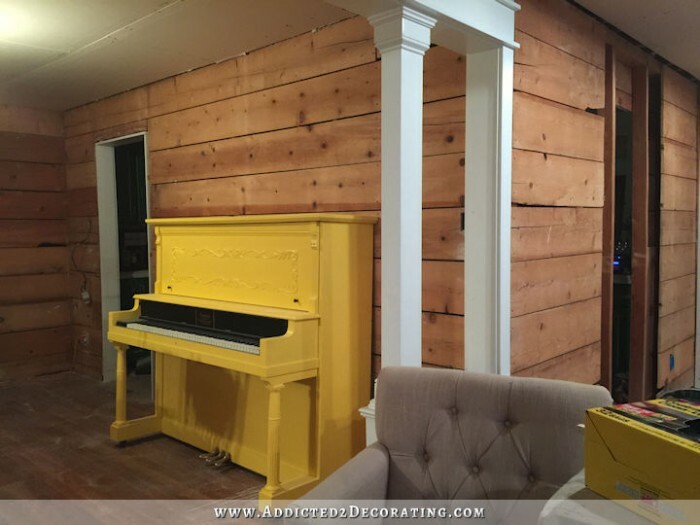 Whether the piano was in its original hideous finish, or whether it was painted yellow, it would still have to be moved to get to that wall. You’d have to explain your thought process a bit more to me for me to accurately answer your question, I think. Aahhh…yes, that does make sense. But even though that makes complete sense, I really don’t have a better answer for you other than “because I wanted to.” 😀 Those fun, creative, pretty projects are what keep me going, and get me motivated to tackle/complete the horrible projects like drywalling, taping, mudding, etc. So sometimes I do them out of order, even if they make no sense that way, just because it’s what I need in order to motivate myself to do the stuff I’m procrastinating on. As long as that ugly, dull, old, brown, light-sucking piano was in the room, I had no motivation to finish up my walls and ceiling, because let’s face it…even with pretty walls, that piano would still be ugly. But now that I have the yellow piano, I see the vision so clearly in my head and I’m so motivated to jump in and get the awful stuff done just so that my yellow piano can shine and I can see my vision come to life. yeah I guess that does make more sense. Motivation is a big factor in getting things done, and having something finished (like a bright yellow piano) does just that! You will be glad of the drywall in the summer too once you do the whole house. It will keep the AC costs down. Would your Father-in-law like to come to Alberta? Beautiful country here. He might like it! 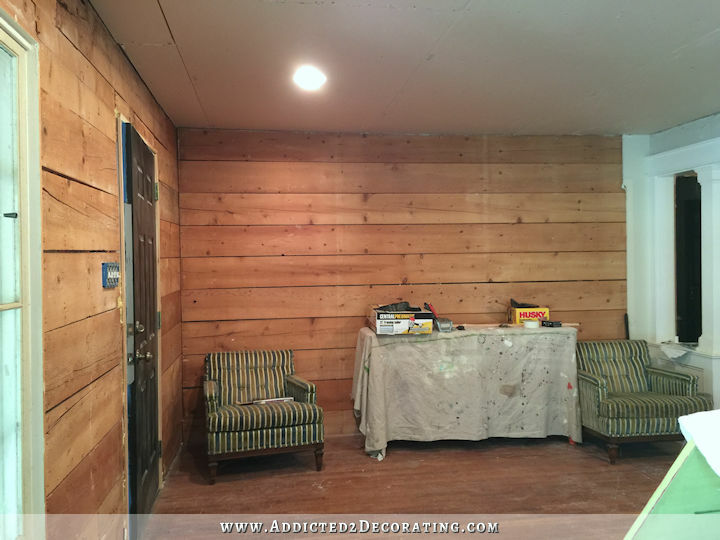 Omg…..I would so keep that shiplap on the wall in the entry hall and just paint it. It’s awesome. What great progress!! I love that you thought ahead to widening and making doors while the walls are to studs, less work for in the future. That dining room would look fabulous with new windows and save time and mess in the future! Can’t wait to see all the “pretty stuff” go in, but also love to see the whole “from scratch” process. You will appreciate having the new insulation in now. Everything looks great! WOW!!! I have no other word just WOW! Awesome, that insulation is going to be a big help. I am soooo super happy for you! What a great father in law. Wow you two make a wonderful team! I am excited for you. I am enjoying your progress and can’ t wait for your next update! Since I have a husband in a chair, I have a nosy question. What did you do with Matt during all this renovation? Doesn’t look like he had room to move around with all the stuff in the middle of the room in every room. Not criticizing, just curious. On days when I have to make a complete mess that doesn’t allow him to get through easily, he’s always perfectly content to spend the day in his game room. 🙂 I always make sure that I don’t block his access to his game room. As others have said, what a blessing your FIL is to you both. Also glad he pushed to get that insulation done now rather than have to tackle it yourself later. So happy for you! Oh Kristi!!! It’s looking amazing. I loved catching glimpses of that yellow piano in your pictures. It’s going to feel amazing. How on earth do you thank someone for doing so much to help???? Words just can’t justify the feelings! What a kind and gracious father in law you have!! I’m so happy for you!! So glad you put in the insulation!! That is going to be the best choice for winter and summer. It’s even more important than the “pretty stuff.” Gasp!